China is building tandem maritime forces, blurring the line between military and civilian maritime missions. The new People’s Liberation Army Navy (PLAN) aircraft carrier, Liaoning, further expansion of the nuclear submarine force, and new warships such as the 052D Luyang III-class destroyer, are all indicators of China’s emphasis on maritime modernization. However, China’s maritime strategy consists of more than just PLAN modernization efforts: It’s building two maritime forces with more than 700 surface ships by 2020. China’s Maritime Surveillance (CMS) agency, under direction from the State Oceanic Administration (SOA), serves a critical role in further developing China’s maritime strategy. The CMS is unlike any civilian government entity in the United States. CMS falls under the SOA for resource allocations and management purposes. If compared with the United States, the SOA would probably be similar to combining the National Oceanographic and Atmospheric Administration, the U.S. Coast Guard and a host of intelligence agencies. While the U.S. equivalents are controlled by three different cabinet level positions (Department of Commerce, Department of Homeland Security and the Director of National Intelligence); SOA is controlled by only one cabinet-level equivalent, the Ministry of Land and Resources. Though the SOA has several missions and controls more than 20 different agencies, it has two primary functions: protection of national sovereignty and as political component of the Party. CMS over the past several years has been tasked with the protection of national sovereignty issues throughout the South China and East China Seas. There are several examples of that including the 2009 USNS Impeccable incident, the planting of a Chinese flag on the seabed floor by a submersible in 2010, CMS ships cutting the cables of Vietnamese ships conducting exploration and seismic surveys in 2011, and the recent dispute in the Scarborough Shoals between China and Vietnam. In addition, CMS ships also have the primary role in patrolling the waters near the Senkaku or Daioyu Islands. These activities suggest China has developed a “first use policy” where CMS ships serve as the front line of protection and the PLAN may serve as the defender of national sovereignty. The SOA established the CMS in 1998 and by approximately 2006 began at-sea operations. The current director, Liu Cigui, served as the former mayor of Xiamen City, and has spent his entire career working through the Communist Party. The party has met with the SOA several times over the past six months. In addition, one of those meetings (a training session) included CMS and People’s Liberation Army personnel. The relationship between the military and SOA seems to be positive and growing. The SOA and PLAN in February agreed to enhance levels of communication, strengthen joint exchanges, and safeguard China’s maritime rights. 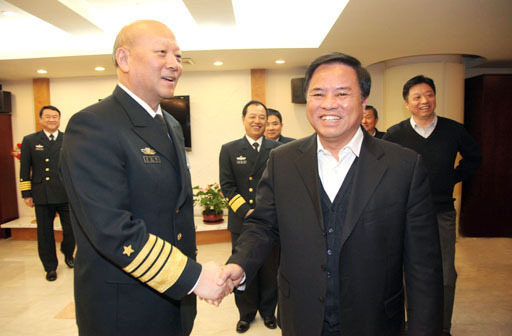 A photo of Admiral Wu Shengli and SOA Director Liu Cigui illustrates the cooperation at the highest levels in government between the two organizations. This established relationship and expansion of SOA assets may indicate China is developing or already has developed two maritime forces. CMS consists of more than 250 naval surveillance vessels with a goal of 350 by 2015. In addition, reports indicate China may continue to build more than 500 surveillance vessels by 2020. However, in what seems to be a theme regarding numerical transparency related to Chinese military and defense activities, there is not an accurate account of the exact number of CMS ships. For example, Jane’s Fighting Ships 2012-2013 does not list all the CMS ships and only briefly mentions 14 naval vessels weighing more than 1,000 tons. This potential maritime force and future build up is substantial given the PLAN working relationship. Three additional developments illustrate CMS as a key contributor in the maritime domain. First, CMS is developing unmanned aerial vehicle (UAV) bases at 11 coastal provinces with at least one UAV per base. The completion of these bases is expected by 2015. One could also expect CMS ships may operate UAV assets at sea for surveillance purposes. Second, a decommissioned PLAN guided-missile destroyer in September was transferred to CMS. CMS intends to refit the warship with small-caliber guns and water cannons. As PLAN modernizes its fleet and decommissions older ships, CMS could inherit those naval vessels for future missions. Third, earlier this year on board a CMS ship, scientists successfully completed the deepest dive beneath the sea (more than 7,000 meters) by a manned submersible. The accomplishment was highly publicized and displayed Chinese leadership support at the highest levels. The buildup of China’s two maritime forces in the region is notable for three reasons. First, the CMS ships provide a network of shared intelligence nodes to maintain a higher level of maritime domain awareness and can assist PLAN operations. For example, the PLAN may deploy warships to a particular area (e.g., Senkaku or Scarborough) and remain clear of visual presence or establish an operational tether as a mechanism for further action. This might be similar to the way the PLAN responded during the 1988 Spratly incident and quickly expanded the size of their naval force as the conflict turned violent. Second, at the tactical level, the additional increase in ships enhances targeting identification and ranges for the PLAN against a potential adversary. Finally, the increased CMS presence in the area may cause and in fact, increase confusion and miscalculation at sea that could lead to an armed conflict. CMS serves as a force multiplier for PLAN thus improving China’s sea power capability. The cooperative effort between the CMS and PLAN to field more than 700 ships by 2020 is a daunting task. While not all ships will operate at sea at any given moment, the working relationship between the two forces expands China’s maritime reach. One can expect future joint exercises and patrols enhancing communication and formation-maneuvering capabilities. However, the level of synchronization at sea combining civilian and military organizations still requires time to mature. “China to Beef Up Maritime Forces Amid Escalating Territorial Disputes.” Asian News International, Jun 17, 2011, http://search.proquest.com/docview/872297805?accountid=322 (accessed October 2, 2012). Richard J. Samuels, “New Fighting Power!” International Security, Vol. 32, No 3 (Winter 2007/08): 84.